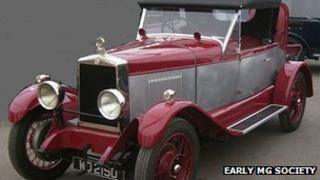 A rare two-seater car found buried under a cowshed in Gloucestershire has won a Best Vintage Car award. All the parts of the 1928 MG MK IV Sports car were found in 1999 on a farm "carefully dismantled" and laid in the ground under two inches of concrete. Fred Body, from Cheddar in Somerset, has spent over a year painstakingly rebuilding the early MG. He said: "It's weird really - most of it was there and most of it was as sound as a pound." According to the Early MG Society, only 135 examples of this model were made in 1928 and this car is the sole survivor in the country that displays the correct coachwork. "When it was found it was completely taken apart, laid out flat and covered in gravel and one or two inches of concrete," said Mr Body, a car enthusiast who bought the parts when the owner put them up for sale. "I think what must have happened was the war was coming and someone thought 'they're not taking my car for scrap'. "They carefully took it apart and buried it thinking they would come back and put it together again." It was only when the shed was pulled down and the floor dug up that the car was discovered with all its identification including Guarantee plate and original number plates. "Some of the original leather from the seats and paint work was there so we could colour match it as near as possible," said Mr Body. "But some of the aluminium had corroded where I think the concrete had cracked and urine from the cow house had got in. "And all the instruments were missing - they probably adorned someone's fireplace - so they were the most difficult to find." At the end of April the resurrected car won the Best Vintage Car award at the Bristol Classic Car Show. A spokesman for the Early MG Society said: "There is no history on this car until 1999 when it was miraculously 'discovered'. "It is now one of the few genuine MGs that has come to light in the last 25 years - it's been a real "from the ground up" restoration."